If you are looking to freshen your dulling complexion, improve skin tone, texture and firmness with a quick and comfortable treatment requiring little downtime, Nano Laser is a good choice for you! Nano Laser is a fast and effective laser treatment that improves skin texture, decreases discoloration and reveals new skin hidden under the dull layers of the upper layer of skin (epidermis) with almost zero downtime. Removing the top layers of the skin will also accelerate your skin’s own renewal process for continued improvement in appearance over time. This is especially useful for people with acne or sunspots. Precision. The Nano Laser Peel can instantly remove the layers of the epidermis using light energy rather than chemicals or harsh abrasives. The laser offers precision to remove the layers to the exact preferred depth. Heat. A Nano Laser Peel can be more effective than a chemical peel because the laser not only removes the outer most layers of the skin, it also heats up the epidermis. This heat stimulates collagen production in the dermal layers which plump up the skin and over time reduce the appearance of fine lines and wrinkles. The heat also results in a tightening effect of the skin in the days after the treatment which will continue to improve for 4-6 months after the treatment. Great Results! 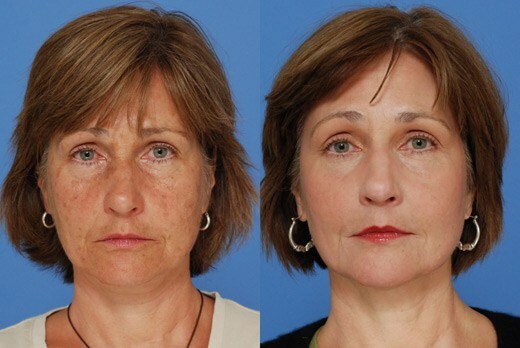 You will see short and long term improvements in your skin after a Nano Laser Peel. Chemical peels and microdermabrasion do not use heat and are only able to scratch the surface of the epidermis which accounts for their significantly less cost and temporary results when compared to a Nano Laser Peel. We typically block an hour and a half for your Nano Laser Peel treatment. We will discuss with you your desired results from the treatment to help us select the exact depth of ablation on the laser machine (usually between 4-12 microns). We will cleanse your skin and apply numbing cream for approximately 20 minutes to reduce any discomfort you may experience during the treatment. Before beginning, the numbing cream is removed and we give you protective goggles for your eyes. The laser treatment itself takes only about 30 minutes. Most patients describe the sensation of warmth or that of sunburn during and shortly after the treatment. After the Nano Laser Peel is complete, your skin will look pink or red, like that of a bad sunburn. Day 1 – Following your treatment, you will be instructed to do gentle cleanses 2-3 times a day. It is very important to keep the skin moist and hydrated during the healing processes. It is also important to not pick or scrub the skin. Day 2 – Your skin will feel tight and rough and start to peel slightly. It is still important to keep the skin hydrated during this period and we will recommend creams to be used during this phase of the healing process. It is also very important to avoid sun exposure as the layers of skin are very vulnerable to the sun’s harsh rays. Once the skin is healed, regular application of a zinc-based sunscreen will help to maintain the youthful look of your skin. Day 3 – Your skin will be incredibly smooth and luminous. Your makeup will go on smoother, dark spots will be lighter, and pores will appear smaller. Your bare skin will have a new, fresh healthy glow. It is important to let your provider know if you have a history of cold sores or the herpes virus as this treatment can trigger a flare-up of the infection. Redness and swelling – this typically last only a few hours or maximum 1-2 days. Please contact us for more information and to set an appointment or email to info@surgeryinperu.com. You can also see other treatments for skin care and skin rejuvenation by checking our dermatology section.